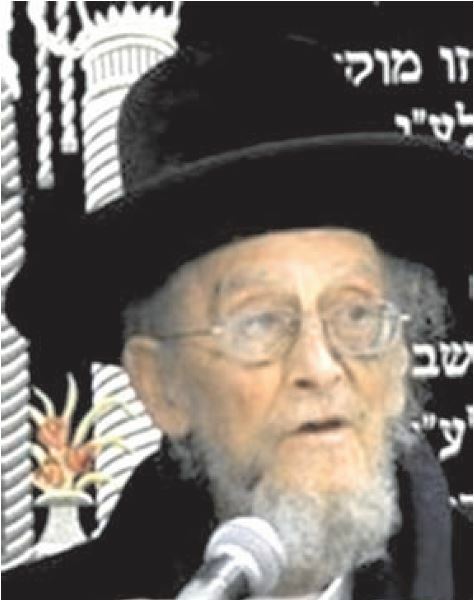 Harav Ze’ev Dov Slonim, Rav of Central Yerushalayim, a member of the Beis Din of Chabad in Eretz Yisrael, and Rav and posek of the Chevra Kaddisha-Chassidim in Yerushalayim, was niftar Monday, at the age of 87. Harav Ze’ev Dov Slonim was born 21 Tammuz 5694/1934 in Yerushalayim to Harav Yehudah Leib and Sheina Liba Slonim. His father was a descendant of noted Rebbetzin Menuchah Rochel Slonim, a”h, a granddaughter of the Baal HaTanya. He was named after his grandfather Harav Ze’ev Dov Slonim, who served as Rav of the Chabad community in Chevron. From his youth, he was known for his genius mind. He learned in Talmud Torah Chayei Olam. It is related that when Hagaon Harav Eliezer Silver, zt”l, visited from America, he farhered young Berele, as he was known, and was very impressed, saying that he was surprised that the Chassidim have such young talmidei chachamim…. Before his bar mitzvah, he was zocheh to receive the brachos of the Imrei Emes of Ger, zy”a, and from the Husiyatiner Rebbe, zy”a. As a bachur, he learned at Yeshivas Toras Emes in Yerushalayim and later in the Mir Yeshivah. When he applied to learn in Mir, he came with his father to the Rosh Yeshivah, Hagaon Harav Eliezer Yehudah Finkel, zt”l. The Rosh Yeshivah asked for his age, and he said that he was 16, the Rosh Yeshivah said that the yeshivah only accepted elder bachurim. When he heard that this was the young prodigy, Reb Leizer Yudel accepted him in the yeshivah. In Sivan 5719/1959, he married Gitta Leah, a”h, a daughter of Harav Yisrael Feldman. After several years, Rav Slonim received semichah from leading Rabbanim. In 5730/1970, he was appointed Rav of the center of Yerushalayim. In 5739/1979, he was appointed a member of the Beis Din of Chabad in Eretz Yisrael. Rav Slonim had a close connection with the Lubavitcher Rebbe, zy”a. One of the positions he held in Yerushalayim was that of the Rav and posek of the Chevra Kaddisha of the Chassidim. Being fluent with many halachos and various minhagim of all communities, Rav Slonim was seen as a foremost source for all questions and inquiries on any sheilah that was related to levayos, aveilus or the like. He held this position for tens of years. In recent months, he was greatly weakened, and was niftar on Monday, at the age of 84. A large crowd took part in the levayah in Yerushalayim. He was buried in the Chabad chelkah on Har HaZeisim.